Like so many sojourners to the Orthodox faith, Mary Hoyland grew up as a regular attendee at church. By the time she became an adult, however, the responsibilities of marriage and raising a young family would come to hamper her ability to remain consistent in her church attendance aside from the holidays. Once her children had grown up and left home, Mary resolved to recommit herself to going back to church on a regular basis. She attended the local church for a time but after not enjoying the services, she moved on and continued to search for a more suitable church. She discovered St. Matthew’s Church in Edgeley where she found a friendly congregation and became involved in the church’s life. All was well until upheaval arrived with the introduction of new liturgies and prayers and a “modern” language that Mary found very disconcerting. The proposed ordination of women as priests also created serious misgivings for Mary and other members as it would turn out. The parish priest himself, Father Gregory, would also become disillusioned by these happenings and he began to explore Orthodoxy. Eventually, Father Gregory would arrange a number of talks about Orthodoxy that Mary and other church members attended. The talks covered various topics such as the Church Councils, Scripture, Orthodox teachings, the origin and tradition of the Church and the Great Schism with Rome. Mary went on to convert to Orthodoxy, along with a number of like minded members, and together they went on to create St. Aidan’s English Orthodox Church under the Greek Orthodox Patriarchate of Antioch. The first Liturgy was held in a rented room in 1994 and, in 1996, the young parish went on to acquire a building that housed another church that put the building up for sale. 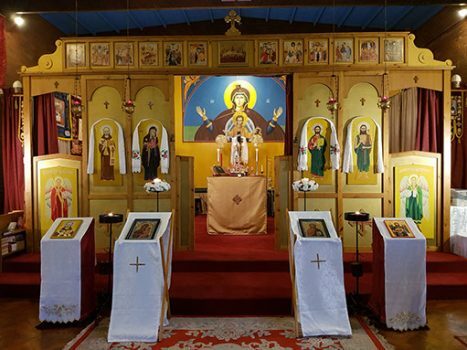 Parishioners worked over a number of years to grow the parish and make it a suitable place for Orthodox worship. On Easter of 1995, Mary and other church members were chrismated and received their first Holy Communion. Today, Mary is happy to go on holiday and visit Orthodox churches wherever she goes.